Why Choose Remanufactured Toner Cartridges? 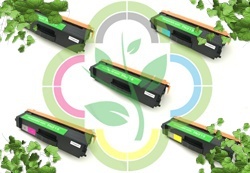 | TonerGreen - Eco-Friendly Toners from the U.S.
Why Choose Remanufactured Toner Cartridges? Remanufactured Toner Cartridges are creating a buzz in the printing industry and green products supporters. So what are these? Remanufactured toner cartridges or sometimes referred to as "remans" are basically empty toner cartridges that have been recycled and reprocessed by professional manufacturers. How are printer toner cartridges manufactured? The process starts when factories received a shipment of used toner cartridges. The toners are then sorted, disassembled, inspected and cleaned by a staff of expert technicians. Cartridges that require new parts are replaced with working components. The cartridges is then reassembled, refilled with high-grade toner and checked for quality through a number of rigorous printing tests. After the toner cartridges go through quality process control, then they're repacked for resale. If they are remanufactured, is their quality the same as new cartridges? Although original cartridge manufacturers claimed that remanufactured cartridges are of low-quality and produce sub-par quality printouts, this have been proven wrong by remanufactured cartridge makers and printer users. Remanufactured toner cartridges are built with recycled OEM parts and premium toner materials to make sure that they produce the same quality of printouts as their OEM counterparts can. But it is also important for you to get references from reliable suppliers or online e-commerce shops before purchasing remanufactured toner cartridges. What are its environmental benefits? The typical toner cartridge is composed of 40% plastic, 40% metal and small percentages of rubber, paper, foam and toner. On average, it takes 725 years for a discarded toner cartridge to decompose. And right now, there are approximately 375 million cartridges used toner that is in our landfills. By supporting, remanufactured toner cartridges, you can help lessen this quantity and reduce pollution. Using remanufactured toner cartridges also saves energy. Approximately 3 quarts of oil are used in the production of a single new toner cartridge. A used toner cartridge can be remanufactured up to four times thus saving 12 quarts of fuel. Recycling printer cartridges is the best thing you can do to save more money while saving the earth! Choose remanufactured toner cartridges now!